Data from the Pew Research Center shows that among social media networks, Instagram has surpassed Twitter in popularity among United States Adults. The research states that 26% of online adults in the U.S. used Instagram in 2014, up 17% from the previous year, and 13% from 2012. 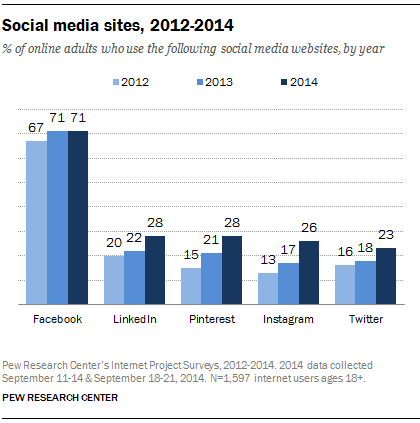 As a comparison 23% of online adults in the U.S. used Twitter in 2014. The data finds that Facebook remains by far the social media site, however over the past year Instagram has made a splash, and engagement on Instagram is 15 times that of Facebook’s! One of the most interesting aspects of Instagram is that it’s not a site, but lives only on the mobile app. Numerous brands have begun to use Instagram as businesses are seeing results from showcasing more visual images. With over 300 million monthly active users, Instagram executives think the network will eventually hit 1 BILLION monthly active users! In less than five years Instagram has gone from it’s infancy to a social media rock star, and i’m excited to see what the future will hold! Is your brand on Instagram, would love to know your experience, and how you are succeeding, or the challenges you face, leave a comment below, or tweet me @MarissaPick. 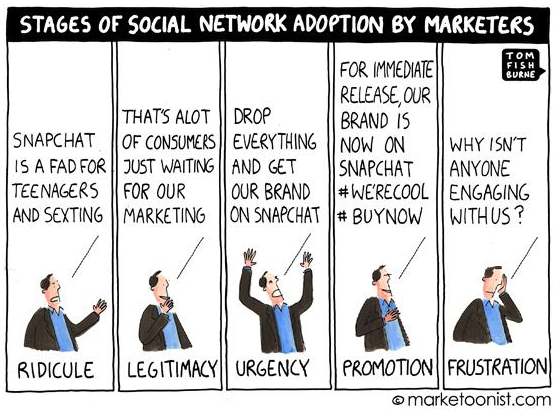 I came across this great cartoon outlining the Five Stages of #SocialMedia Adoption by Marketers from the brillant @tomfishburne, enjoy!